ZEVETA AMMUNITION, joint-stock company has had almost 70-years of tradition in manufacturing military ammunition. It was founded in 1938 as ammunition manufacturer and its very first production programme concentrated on jobs for the military. dummy targets for the protection of aviation technology in diameter 26,5, 1×1", 1×2"
garden flares pyrotechnic works, etc. The decomposition of ammunition and subsequent ecological disposal of obtained material was associated primarily with monitoring of decomposition process safety. That was improved by designing and manufacturing of the company s own technological facilities and whole range of other technological aids emphasizing the safety during decomposition of ammunition and pyrotechnical items. Since the year 2004, ZEVETA AMMUNITION joint-stock company has been participating in a vast decomposition programme aimed at safe and ecological disposal of surplus and unmarketable military stock as ground and aircraft ammunition, mines, engineer and pyrotechnical material and other commodities. Realisation of this impressive project, which has been the first one in the history of Czech Army as to scale, enables to save on costs incurred by storage and guarding of ammunition at military facilities, reduction of its possible misuse, creation of numerous job opportunities at decomposition and disposal plants and the last but not the least to mention it the utilisation of obtained materials in industry and construction. The ZEVETA AMMUNITION joint-stock company in Bojkovice has developed special testing laboratories to enable extensive testing of pyrotechnical products in accordance with valid EU legislation. The testing laboratories are utilised to test and re-test pyrotechnical products prior to their marketing. 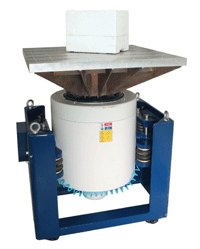 With respect to the unique nature of testing facilities, these are also used to test products with special characteristics. Testing facilities can be also used to test wide range of products under extreme climatic conditions, verification of durability of products and packaging under various transport conditions etc. 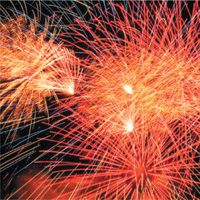 The aim of this course is to provide theoretical and practical lectures to applicants for achievement of professional qualification – Fireworks Operator – in accordance with the Act No. 61/1988 Coll. on mining activity, explosives and the National Mining Administration, passé by the Czech National Council, as subsequently amended. The course is arranged as a one-week residential course. The course comprises of lectures, consultations and self-studies. The integral part of the course is the practical training at blasting grounds within the company premises. The course shall be completed with the final exam in theory and practice supervised by the NATIONAL MINING AUTHORITY. DGO-1 The smoke grenade model DGO-1 has been designed for quick defence of tanks and similar military objects against highly-accurate guided weapons and reconnaissance-firing systems using visible and infrared spectres of the electromagnetic radiation. DGO-3 The smoke grenade model DGO-3 has been designed for quick defence of armoured materiel and similar military objects against highlyaccurate guided weapons and reconnaissance-firing systems using visible and infrared spectres of the electromagnetic radiation. DG-50 The smoke grenades are used as technical pyrotechnics for signalling and communicating. The smoke grenades are manufactured at color version: white, black, red, blue, orange, green, yellow. Delay time 4 seconds after throw-off. Smoke generating time 25-50 seconds. This product is designed to create a dummy target to attract a travelling anti-aircraft missile with automatic infrared homing system. This cartridge comprises an aluminium case of square, rectangular or circular diameter. Inside cartridge case is integrated pyrotechnical generator with determined wavelength and pyrotechnical safety ignition system. The case mouth is sealed with a cap. The cartridge is also provided with an appropriate electric priming screw. All kinds of cartridges are packed according to ADR regulations. 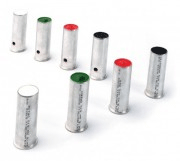 These cartridges are ignited with electric impulse and launcherscomply with STANAG regulations. PPI-26-IV CS This product is designed to create a dummy target for anti-aircraft missile with automatic infrared homing systems. The product comprises an aluminium case of circular diameter provided with a head. The case bottom is fitted with a priming screw. The cartridge further comprises a pyrotechnical generator and a cap, which seals the cartridge. This ammunition is waterproof. These cartridges can be launched using ASO-2 or ASO-2 V launchers mounted on helicopters or other aircraft. 26,5 mm The signalling ammunition has been designed as pyrotechnical means to be used with signalling guns. The very signalling rounds have been designed to produce a lighting or sound effects. Every package of signalling ammunition contains 10 cartridges. 40 mm This ammunition is used for terrain illumination and possible signalling. When launching, the round shall be held in hand and leaned towards a suitable support in order to point the round muzzle into desired direction. Upon unscrewing the cap, release the rip cord with ring ending. Short draw on the rip cord leads to launch. The outlet part releases a flare, which ignites a parachute light flare at the distance of approx. 400 m from the muzzle. The universal hand grenade has been designed to destroy enemy live force. The controlled decomposition of the grenade body enables to achieve improved shell effect. 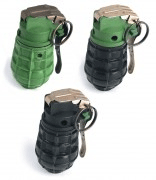 The universal hand grenade is fitted with a igniter featuring a lever to enable selection of time or impact initiation with mask safety and auto-destruction. The grenade has been designed to function within the temperature interval from -50 °C to +50 °C. All models of URG-86 are packed by twenty pieces in hermetically sealed metal boxes inserted into a wooden crate. FRICTION IGNITERS TZ-M / TZ-M 3 Friction igniters are timed pyrotechnical initiators used to initiate of designated types of training simulation ammunition or specifically selected products. The product comprises of igniter body with an integrated friction ignition system, the very pyrotechnical deferred fire fuse with pinched Al cavity containing the blast support matter. Loosening of the cap from igniter body and sharp rapture of the wire friction member leads to initiation of the deferred fire fuse with set time delay followed by activation of the blast part. The product is waterproof and it can be used within the temperature range from -30 °C to 50 °C even under adverse weather conditions. Igniters are packed by 10pcs in nest bowls and fixed with shrink-wrap inside the transport packaging. ELECTRIC IGNITERS / EZČ / EZO Electric time igniters or the immediate electric igniters are used to activate the implemented simulation and training pyrotechnical ammunition. This product is based on advanced module of the TZ-M friction igniter, whereas the friction detonator is replaced with an electric detonating system. The timed version is manufactured at several steps: 2, 4, 6 and 8 seconds. Igniters are packed in nest bowls same as other TZ-M products. Further, these packages also contain leads for easy connection of the priming system to igniters. P-1 and P-2 WITH TZ-M3 FRICTION IGNITER Riot control smoke puff charges model P-1 and P-2 are used by armed forces for special Purposes. The product comprises an aluminium case of approx. 50 mm in diameter, which contains 14 mini puff charges for P-1 and 10 mini puff charges for P-2 as well as 4 generators with CS agent. The case is sealed with a plastic cover and flanged. P-1 and P-2 CS WITH LEVER IGNITER The riot control smoke puff charge P-1 and P-2 with lever igniter forms a complete product ready for immediate use. This is a modernised product for immediate use during operative actions of armed forces. Once released from hand, the igniter shall disengage the lever and the cocking mechanism will activate the primer. The blast from primer will light up the deferred fire igniter, which will activate the very puff charges within 2,5 seconds and there will be spread of mini puff charges generating particular blasts of 130 to 160 decibels and the tear gas screen at P-2. The user shall wear mandatory protectives and follow defined instructions. Products model P-1 and P-2 CS with the lever igniter are packed similarly as TZ-M smoke puff charges. The manual emergency torch with red light is used as virtual emergency SOS sign. The product comprises of a handle with screwed cap and a steel tube of 30mm in diameter containing pyrotechnical composition with integral friction igniter. Functioning (burning) of the torch is initiated by rapture of the friction wire located underneath the screwed handle cap. The product works immediately under any weather conditions. Once burning, the torch can not extinguished (not even submerged in water). The product can be used outside, i.e. on sea, in the mountains, in sea freight or road haulage for visual signalling. The product is waterproof. This rocket is designed to assist in calling for help in case of emergency. The product comprises a hard launch part, which hosts the initiation system. Another part includes the rocket body with motor, a light flare, a parachute and a ballistic cap. The rocket can be launched from hand by rapture of the friction wire located underneath the screwed cap onto the lower launching part. Rocket is initiated immediately. Once the rocket has reached height of approx. 300 m, red flare light will be ejected. This red flare light will then fall to the ground slowly. The product shall be used mainly to call for help on seas or mountain ridges, where the risk of forest fire is eliminated. This product has been designed for illuminating, marking or lighting up pyrotechnical items. Burning time approx. 7 min. The torch may be acquired and used by a trained person of 18 years and older only, fireworks operators or a bomb disposal officer. The torch has been classified into class T1 in accordance with the Ordinance no. 174/1992 Coll. issued by the Czech Mining Authority. The windproof igniter is a paper cavity filled with compacted pyrotechnical composition provided with a tip made of friction matches mixture. The bottom of this cavity is filled with a non-flammable matter. This product is intended for light up of pyrotechnical items. The windproof igniter has been classified into class T1 in accordance with the Ordinance no. 174/1992 Coll. issued by the Czech Mining Authority. The windproof igniter may be acquired and used by a trained person of 18 years and older only, fireworks operators or a bomb disposal officer. This igniter is packed in cardboard boxes holding 60 pcs each (6 packages containing 10 pcs each in polyethylene bags).